The remarkable range of Fibrescopes give you the inside edge on diagnosing hundreds of maintenance and repair problems. Fibrescopes are also known as Low Cost Endoscopes, Fiberscopes, Internal Inspection Tool, Internal Bore Viewers, Interscopes & Scopes. The revolutionary flexible shaft adjusts into almost any position. The comfort grip handle allows one hand operation with all the View controls at your fingertips. An integrated focus ring ensures smooth continuous operation while focusing. A high powered lens clearly focuses on objects as close as 19 mm while a powerful halogen lamp illuminates dark areas with the simple push of a button. The high impact ABS housing is ready for field use. The sealed lens and shaft may be immersed in liquids without worry. Powerful halogen lamp for optimum illumination. One hand operation with light switch and focus ring. Easily check for blocked pipes, vents etc. Optional, clip-on 45 degree mirror makes inspection a snap. Fast and complete heat exchanger inspection with mirror accessory. Can be used for all types of diagnosis. 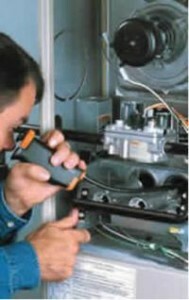 Inspecting a hard to reach point in a heating system. Quick detection of damaged parts without need for dismantling. Warranty: Excludes damage caused by misuse, accidents or modifications to the product. Warranty is void if the user opens the handle for any reason.